I have an old existing slab that is 11 x 16 ft 4" thick. At one time I had a metal shed on it but it got rusty and we tore it down. I want to lay concrete block all the way around the slab and use 6x8x16 concrete block and fill the cores and use rebar both horizontal and vertical. It will have only one door no windows. I am not sure how wide and deep to make the footing. The building will be mainly for storage and will have an 8 foot ceiling. My address is in the county of San Diego the soil is hard pan clay and rock. Thanks for your great question. Footings for such structure as you described requires 8 to 10 inches thick footings. Depending on how high the walls 12 to 16 inches wide with 2#4 should be sufficient. 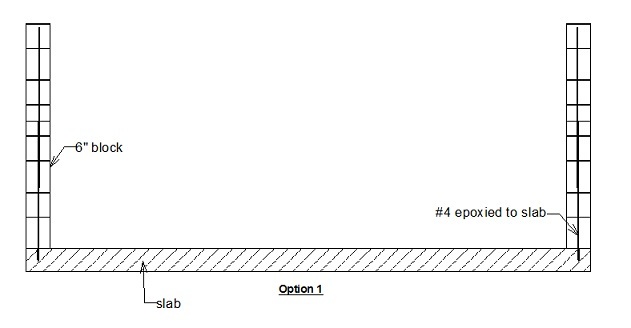 Sketch option 1 gives you an idea if you just use slab without the footings. Constructing a concrete footing on top of existing slab without severely damaging the slab will be difficult. 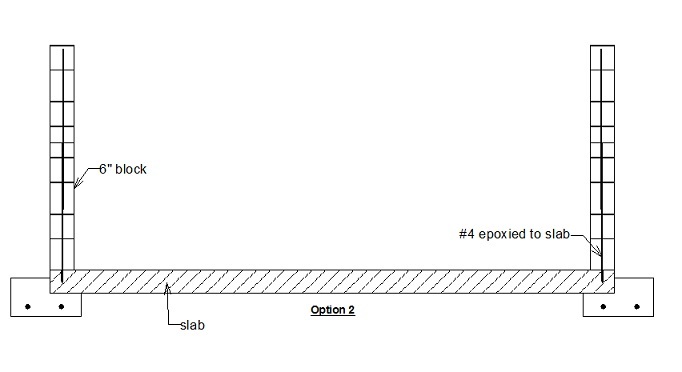 Option 2 below provides an option of installing the footings all around adjacent to the existing slabs. Structurally this option is the best but it will be a lot of work to dig around and below the slab. digging and pouring concrete footings beneath the existing slab will provide the needed strength to support the block walls. The epoxy dowls shown in both drawings are needed to anchor the block walls to the floor slabs. This is extremely important because these dowls will prevent the structure from sliding due to wind or earthquake forces. The dowls for the walls are normally spaced at 48 inches on center both vertically and horizontally. You can still use option 1 by first installing the 8 inches thick footing on top of slab but be very careful minimize the damages to the slabs. You can drill pieces of #4 bars adjacent to the form as stakes.